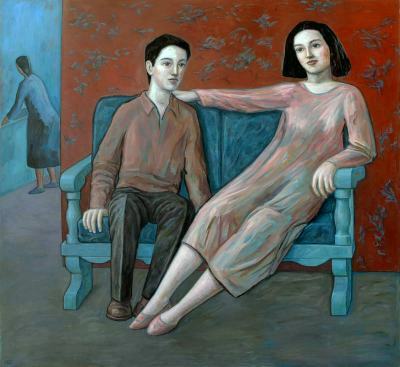 The feet of both figures are placed close together, as if expressing their common familial roots; at the same time, the arrangement of their figures seems to suggest that in growing up they have become more and more separate, as the particular destiny of each one takes form. The red background acts as a common element of expression that reinforces the union of the two figures. On the left, another aspect of reality appears, one which is less obvious: in the adjacent kitchen, a servant is busy with one of her chores. Without the often selfless work of others, their parents most of all, these young people would find it difficult indeed to realize their projects or fulfill their dreams. The painter sees them in the context of the current crisis —economic, but especially in terms of values— which has so affected the young people of today.